As I’m writing this, I’m in Zermatt, Switzerland for a 3.5-week on-snow training camp!! I’m beyond excited to train at an on-snow venue (with a full course!) for a little under a month, as I haven’t skied a full competition-ready mogul run since US Nationals back in March!!! Unfortunately, the resort didn’t open at all yesterday due to high winds, meaning that we were forced to cancel training. Despite this, the weather in the village was absolutely gorgeous, allowing for a little bit of exploring! Today ended up being our first day of skiing — and I couldn’t have asked for a more spectacular day of training!! Excited to be back in Zermatt! 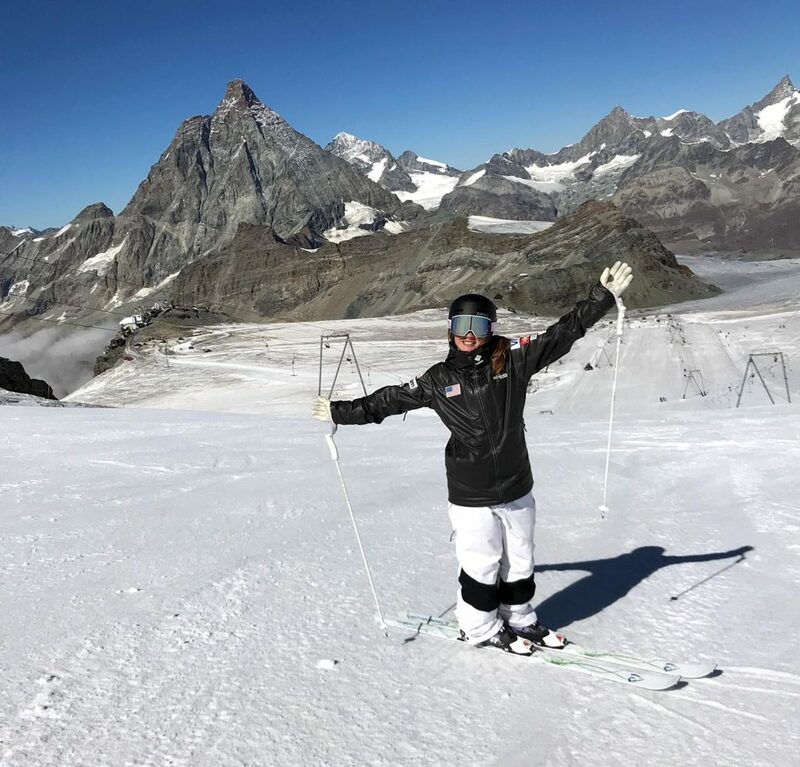 During this camp in Zermatt, I anticipate taking all of my higher DD (degree of difficulty) tricks I have been working on all summer to a full run with moguls, as well as developing my skiing technique a bit more. To prepare for this, I made a few final touch-ups on all of my tricks over the past few weeks on water ramps — here’s a few videos of my favorites! Beyond water ramps, I’ve been spending the remainder of my summer days in the gym. This past month has been largely focused on heavy strength as it coincides with power (i.e. moving personal bests at a fast rate), which is crucial in order to be competent at mogul skiing. In addition to the normal front squat, my strength coach has been getting pretty creative with ensuring that we are developing overall strength and power (below is an example of a new exercise!). In other news this month, my teammates and I conducted a hugely successful fundraiser in Vail, CO to benefit the unfunded athletes on my team. My teammates, Jaelin Kauf and Tess Johnson, along with long-time USA Freestyle supporters, Jeffy & Jim Benedict, spearheaded an awesome event at the Red Sky Ranch & Golf Club. As a result of this fundraiser, each of my teammates on the “B” Team will receive over $10,000 towards their skiing expenses for the year, which is HUGE! Whether they be mogul skiing fans, friends and family, or Vail residents interested in learning more about what it’s like to mogul ski on the World Cup circuit each year, it was pretty amazing to see the fantastic community that came out to support us in Vail (not to mention the numerous online donations we received)!! With that in mind, the event was really humbling for me. The support we received certainly made me aware of the wonderful community I’m a part of as a mogul skier on Team USA. Furthermore, we were able to fund a decent portion of the team’s season, which inevitably brought us all closer as teammates and friends. These funds will now help all of the athletes to really focus intensely on the final two months of training leading up to the first World Cup event in Ruka, Finland on December 7th. While this month has been somewhat mellow, I hope to share more frequent updates with you throughout my time in Switzerland — it’s sure to be an absolute blast!! Again, thank you all for following along!